"Lucinda Lions is the ultimate professional, re-writing our website copy resulting in positive feedback and more customer enquiries. Her creative insight and attention to detail is second to none. Lucinda displays such pride in her work and goes out of her way to fulfill your every need. Having the right website copy is so important so choose wisely....choose Lucinda when it's time to consider a website copywriter." "We are really happy with the website copy that you’ve written. Thanks again for all your hard work….greatly appreciated." “Lucinda, many thanks for supplying us with great copy for our website. You were able to sort through all of our ‘bits and pieces’ of many ideas we had and bring it all together in one clear, concise, targeted, easy to read, organised format. Thankyou! Your copywriting assistance in writing our submission for ‘2011 Buyers Agent of the Year’ award was invaluable – seeing us chosen as a finalist. (Whoo Hoo!) As a small business, it is a really important award for us, but one that got relegated to the back burner when the busyness of the everyday running of the business took over. We appreciate you being able to respond so quickly for our urgent plea for help! Without you, it simply would not have happened. I have no hesitation in referring your services to my friends and business contacts and I hope we have the opportunity to work together again in the future." "Working with Lucinda Lion from Lion Writing for my website copy has been a fantastically enjoyable and easy process. She has mastered an easy way to find all the information about your business that you know, and as a bonus you get to revisit and rethink about your business which in these busy times is invaluable. The resulting copy was magical and I know that my website will truly stand out and not be passed over. Thanks Lucinda, I look forward to working with you again." "We found Lucinda Lions from Lion Writing wonderful and easy to work with. She understood our business which made it so much easier to explain what we wanted. We were more than happy with the copy she provided and she even went above and beyond, helping us with extra material. We would definitely use her in the future and recommend her to others." "Wow and thank you! The website copy truly is terrific! Thank you for absolutely everything you've done for the website." "We're really happy with the web copywritng work that you've done. Quite frankly, I am in awe of your ability to write so well." "Lucinda I am delighted with the copy you've written for my website. It has been a pleasure working with you and I won't hesitate to contact you with any future projects." "I hired Lucinda Lions from Lion Writing to re-write the words on my website. I found Lucinda to be fast and efficient, and working with her was an absolute joy. Lucinda knew exactly how to turn my information into great, persuasive copy. It was such a breath of fresh air dealing with someone as professional and efficient as Lucinda. The first draft was SPOT ON! I’d recommend the Lion Writing ‘Small Business Copywriting Package’ to anyone who needs excellent copywriting without the massive price tag." "Lucinda is like a word chef. She takes your raw ingredients, listens very carefully to what you want to say, and then magically creates something simple yet much more appealing." "We are very happy with the work that Lucinda, a Sydney copywriter, from Lion Writing did for us. She took the time to listen to our needs and did a lot of research in order to provide us with the best written solutions for our website, brochure, business tag line and articles. There were certain messages that we wanted to get across to our customers about our honesty and our dedication to keeping motorists safe, and she managed to sum up everything I’d told her in a really unique and persuasive way. Not only were we impressed with her writing, but the whole process was enjoyable thanks to her professional attitude and friendliness. Not only that, she passed along some excellent marketing ideas, many of which we will implement in the future. Having an outsider analyse and re-write our promotional and marketing material was a great idea, because it allowed us to improve things that we just didn’t see because we were too close to the business. We are also grateful for the free plug she gave us in her newsletter, website and other places." "We really enjoyed working Lion Writing, they brought a new perspective to an initial idea we had, and managed to see it from an alternative angle. Our internal marketing team had written some content for a new concept for our website, but we couldn’t quite get the polish it needed to make us feel confident we had got our message across effectively or succinctly enough. Lion writing was able to bring a fresh set of ideas that refined our copy and helped us achieve our objectives. They were enjoyable to work with, but more importantly, they were prompt and responsive with all correspondence. I would highly recommend Lion Writing." "THANK YOU VERY MUCH for the brilliant "copy" you wrote for me - love it. I feel so confident about it and feel that it will serve me well in my celebrant career. I will definitely keep in touch and will pass on your details if anyone asks." "It's a real pleasure to work with Lucinda. I needed help with re-writing some ads and promotional material, plus an elevator speech. It was obvious from the moment we spoke to each other that Lucinda had done her homework. I was very pleased with the outcome and I look forward to a continued business relationship with Lion Writing. As an aside, I like the way that Lucinda, without being asked, has looked for opportunities to promote our business. I don't think we'd get this 'extra' service from anyone else." "Wow - I've just read through your copy and I'm TOTALLY thrilled to pieces with what you've produced! Thank you so much! You make it seem so easy to pluck out those words! Lucinda I am really happy with how you've managed to tie it all in together. Truly amazing." "Thank you for all your efforts in relation to our website and thanks for the free plug on your website. Look forward to dealing with you again." "We are a very small business and Lion Writing is the first business we have engaged to help us get started. To be honest, we didn't really know what to expect from a professional copywriter when we approached Lion Writing to create a direct mail letter for us. Thanks to Lucinda, we got more than just great writing. We were very impressed and extremely grateful to deal with a person so obviously passionate about her craft. Lucinda is very approachable and open to discussion and change. Her processes are clear and well justified. Lucinda wanted us to be happy with the outcome and was very thorough and applied lots of lovely marketing ideas to bring us the best result. I have to mention as well that Lucinda is very encouraging and positive and made us feel more confident about the big leap into business we are taking. You won't find an easier person to deal with. Thanks again Lucinda." "Thank you for your great work, Lucinda! I love what you came up with. It’s been an absolute pleasure working with you and I will definitely be in touch again in the future! I’ll also be passing along your web address to any friends or clients that I think could benefit from your work. Thank you for doing such a great job in so little time, I really appreciate it!" "Thank you for your thorough website assessment and for all the feedback you’ve provided. The article content you’ve written for the website is excellent. It’s been great working with you." 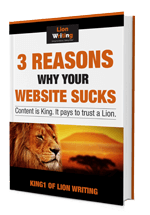 "I enjoyed working with Lion Writing because the process to gather my business story was painless. The procedure was fulfilling and at the end I achieved an outcome and felt good about myself. My self-esteem was boosted." "I asked for Lucinda's help with my web content, because while it read well I lack the skills for writing persuasively in a marketing context. I couldn't be more pleased with the job she has done and can't wait to incorporate her ideas into my site. At all times I received great communication and particularly appreciated Lucinda's enthusiasm and encouragement. Lion Writing can't be recommended highly enough to anyone seeking to maximise the potential of their marketing material." "Although I was able to write my own website copy, what I needed most was a copywriter to make the website wording more persuasive. Lion Writing was able to do this. The work was delivered on time and I’m happy with the results." "A few weeks ago I placed a post on the Flying Solo Forums as I was looking for a copywriter. I received a few names and eventually decided on Lucinda Lions. What a wise decision that was. Lucinda from the start was warm, approachable, professional and I felt, had a total understanding of what we were trying to achieve with our copy. She asked us to complete a very involved questionnaire so that she could get an in-depth knowledge of not only our services, but of who we are as people - something that in our industry is vital to our success. The more we worked through the process and the more I communicated with Lucinda, the more it felt as though she were actually a part of our team. What more could we ask for? Lucinda far exceeded my expectations with the copy and I will have no hesitation in using her again or recommending her to colleagues. She has not only an excellent work ethic, but a great personality!" "As an accomplished writer myself, I hesitated for months to send my words to a copywriter. I knew I could do it on my own. But the marketer in me also knew that a brochure was a completely different kettle of fish to my normal writing style. So, after sitting on an outline for six months, I sent Lucinda my draft and she sent back the words that will work in a professional brochure. It was quick, effective, and well worth the investment. As a solo-preneur, I need to remember that I shouldn’t do everything on my own. I’m only sorry that I didn’t engage Lion Writing six months ago." "Thank you so much for the website copy. We love it and it really has lifted a burden off me. I should have sent you an email 4 months ago when I first looked at your website."